Ladies and gentlemen, this is one of the reasons you should have a Home Inspection by Wayne Collier Home Inspections. A potential life saving issue was found in this home. 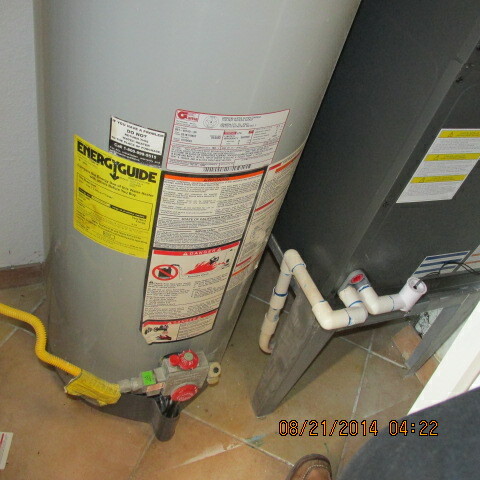 A gas water heater installed right next to an ignition source. You r…eally hate to sound alarm bells and question a contractor if that is who installed this. It would seem that possibly the original homeowner did this as it’s a foreclosure. After further research and consultation we have determined this to be a serious hazard that may result in death if not replaced with an electric water heater. The air handler is not only electric but produces a spark at time of operation. Gas and an ignition source do not mix and one final note, the air return is at the bottom of the handler in the photo making it matters worse.